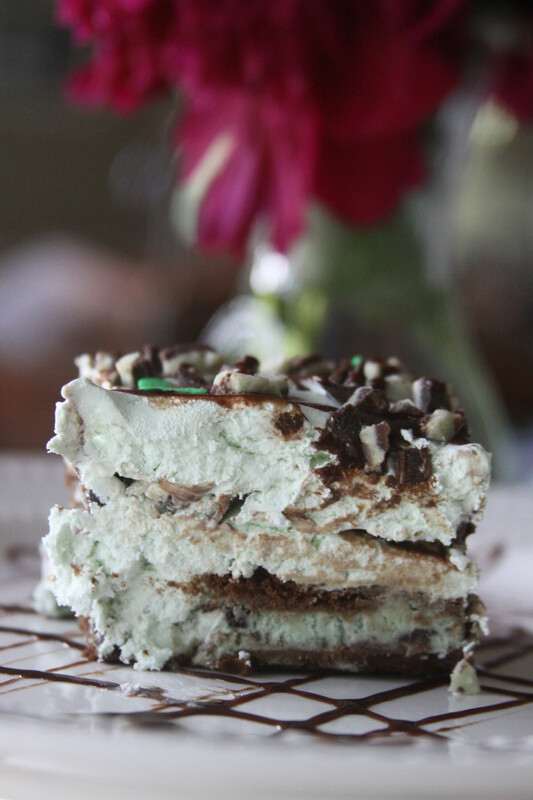 If you love mint, grasshoppers, Ande’s mint’s, ice cream, or cake you will love this unbelievably simple homemade ice cram cake. You can throw it together in about five minutes, and I guarantee you will not have a piece left over! I very recently shared a super easy recipe for homemade ice cream cake with you all and mentioned that I was anxious to try some other varieties of the cake. Well I sure did, and I have a winner. 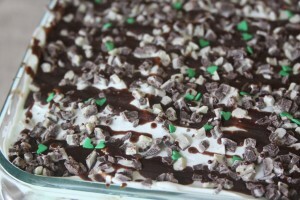 My husband loves mint ice cream, and mint candies, so when his birthday was nearing I decided that I should come up with a mint version of the super easy ice cream cake. Sure glad I did, because this one is a keeper and I have already made it three times since, and been asked for the recipe a few times. 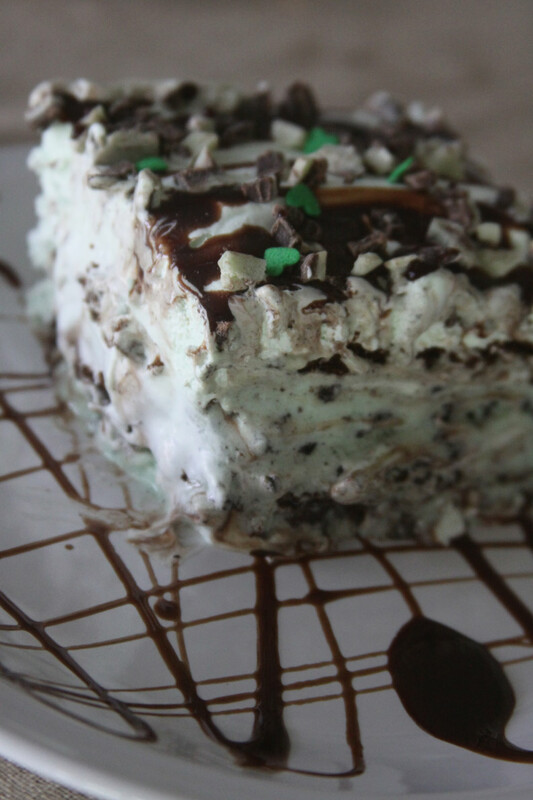 I don’t always love things flavored with mint, but I do love grasshoppers and I was surprised at how much I loved the flavor of this ice cream cake! 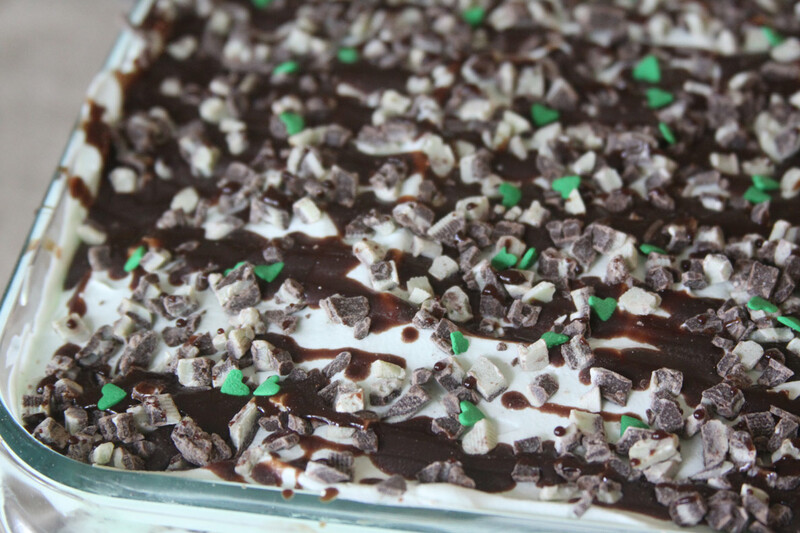 Just a few simple ingredients make this cake frozen mint grasshoppers bliss in a pan! It is so simple to throw all of the ingredients together into a 8 by 8 glass Pyrex dish and stick into the freezer and oh so amazingly delicious. 1. Layer the bottom of your pan with ice cream bars, cut to fit sides if you need to. 2. Fold a tablespoon or so of the Mohawk Creme De Menthe into the Cool Whip. Add as much or as little as you like and taste test it until you get the amount of flavor you would like. I also added a couple drops of green food coloring to make it a little darker green. 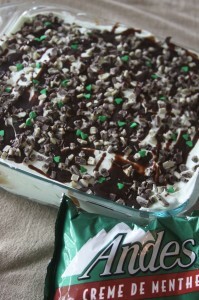 Add a layer of the Creme De Menthe flavored Cool Whip over the ice cream bars (use 1/2 of the Cool Whip in the container). 6. 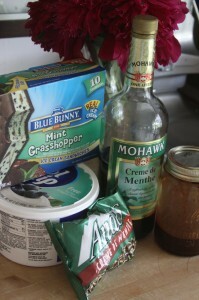 Add another layer of flavored Creme De Menthe Cool Whip (use up the rest of the container). This is a total crowd pleaser for parties or a great treat to make and keep in the freezer for a sweet summer treat after dinner. The mint and grasshopper flavors are just right together and are one of the best ice cream cakes I have ever had. It is hard to believe it is so easy to throw together. Hope you give it a try and enjoy it as much as we do. Happy summer! 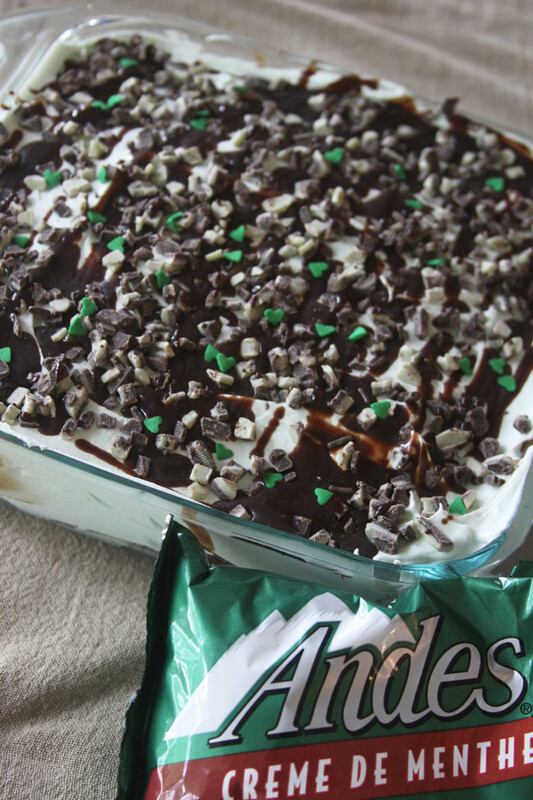 I LOVE mint and chocolate together! This sounds so delicious!